Thread and varicose are the two terms used to describe abnormal vein conditions. Both abnormal vein conditions occur mostly commonly on the legs but the similarities end there. 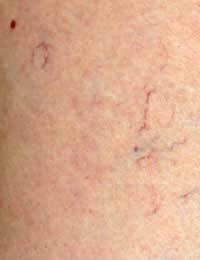 Thread veins also called spider veins or broken capillaries, are enlarged blood vessels that can very clearly be seen through the skin. These small veins carry blood back to the heart after it has circulated through the body. When the veins become enlarged they show through the skin in a spider web like formation. Varicose veins are also swollen, or abnormally enlarged, veins, but unlike thread veins they are found deeper in the body under the skin. These veins are also responsible for carrying blood back to the heart from the legs. However, in the case of varicose veins the valves that control the flow of blood in an upward direction become faulty and allow the blood to travel backwards or pool in the vein causing the distortion or enlargement. Thread veins that appear on the legs are usually caused by the development of varicose. However, in the early stages people may only notice the symptoms of the thread veins. This vein abnormality is a sign that blood is not flowing properly in the legs and since the thread veins are smaller and less structurally sound, they usually break or enlarge sooner and more noticeably than the deeper varicose veins. A weakening of the vein valves ultimately causes varicose veins but the cause of the weakening can differ. The most common cause is age. Years of standing upright, walking, and putting pressure on the legs will eventually weaken structure of the vein. However, things like genetics and pregnancy can also have a hand in their development. If your parents or grandparents had varicose veins then you stand a pretty good chance of developing them also. This is because the weakening of the valves seems to be hereditary. Pregnancy can also cause the develop of this abnormal vein condition because as the baby develops its extra weight puts excess pressure on the veins that travel from the legs, through the pelvis, and up to the heart. This extra pressure can cause slow blood flow, backpressure, and eventually the development of varicose veins. The treatment for these two abnormal vein conditions varies just as the actual condition does. For thread veins, which are more embarrassing to live with than painful, many suffers usually settle for camouflage techniques as opposed to treatment. Cosmetics, fake tanning creams, and clothing items can be used to hide the unsightly veins. When treatment is wanted, however, laser treatments and sclerotherapy are the two most common ways to go. Laser treatments for thread veins involve the use of specific lasers that eliminate the broken capillaries. This treatment method is very effective but sometimes results in pain and bruising at the treatment site. For larger thread veins, sclerotherapy can be used for treatment. This method involves the use of an irritant chemical that is injected into the affected vein. The chemical then causes the collapse of the abnormal vein. This procedure also comes with a few side effects, like leakage of the chemical into healthy areas of the leg, so a qualified specialist should be used and the risks discussed prior to treatment. Treatment for varicose veins is more difficult and involves vascular surgery. If your varicose veins become extremely painful, excessively swollen, or if they interfere with your daily life, you need to consult a vascular surgeon for treatment options. Since treatment of both thread and varicose veins is major, the best way to deal with this abnormality is to avoid developing it in the first place. Things like exercising regularly, avoiding the act of standing on your feet for long periods of time, propping your feet up when you sit down to relax, and avoiding the gaining of extra weight, can all help relieve the pressure on your veins and help you avoid developing these conditions. Thanks for sharing the causes & treatment for the varicose veins. Really an informative blog!! !